This press release, “NFL Must Tackle Super Bowl Abuse Myth”, is going out to over 10,000 media outlets at 9am today. Now, we are calling on EVERYONE to call the NFL main office at 1-212-450-2000. Please tell Commissioner Goodell to speak out against the myth that Super Bowl Sunday is the “biggest day of the year for violence against women.” Telephone him at: 1-212-450-2000. The DV lies must stop. Please pass this along! 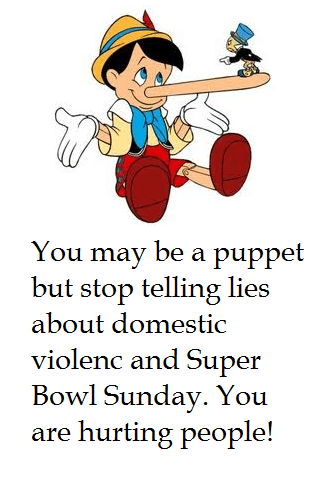 WASHINGTON / February 4, 2011 – A victim rights group is calling on the National Football League to denounce the myth that Super Bowl Sunday is a “day of dread” for victims of abuse. Stop Abusive and Violent Environments – SAVE – believes such claims foster hysteria and trivialize the problem of domestic violence. But Christina Hoff Sommers of the American Enterprise Institute doubts that view. “Women who are at risk for domestic violence are going to be helped by state of the art research and good information. They are not going to be helped by hyperbole and manufactured data,” she explained in a recent interview with The Daily Caller. NFL Commissioner Roger Goodell has recently joined the 15th anniversary team of the National Domestic Violence Hotline, along with other sports figures. Stop Abusive and Violent Environments has recently released a video, “Seven Key Facts about Domestic Violence,” that documents how partner abuse is an equal opportunity problem of men and women: http://www.saveservices.org/key-facts/ . SAVE sponsors the TEPA (Training, Education, and Public Awareness) Accreditation program, a quality-assurance initiative: http://www.saveservices.org/service-providers/ . And SAVE will be holding a conference February 24 in Washington DC. Persons who wish to attend “Hoax: The Continuing Distortions of Domestic Abuse” should pre-register here: tstoddard@saveservices.org . SAVE is a 501(c)3 victim advocacy organization working for evidence-based solutions to domestic violence: www.saveservices.org .